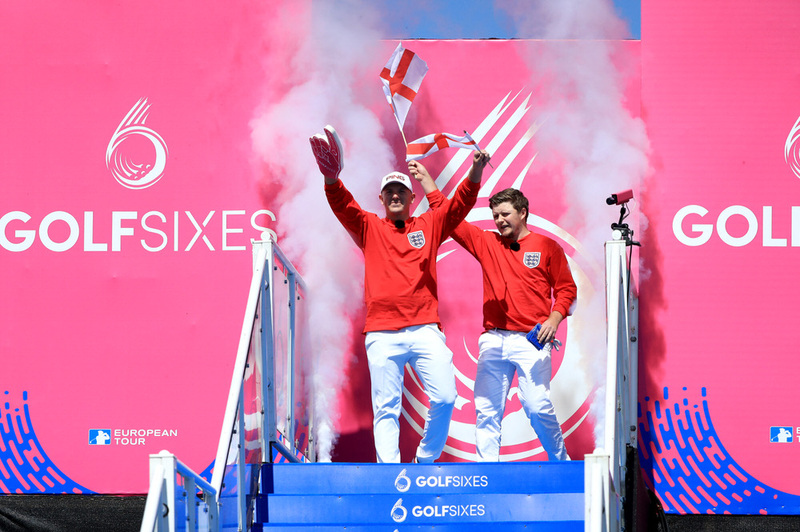 Ireland's Gavin Moynihan and Paul Dunne plan to show the England Women's team of Georgia Hall and Charley Hull no mercy when they meet in today's quarter-finals of the GolfSixes at The Centurion Club in St Albans. 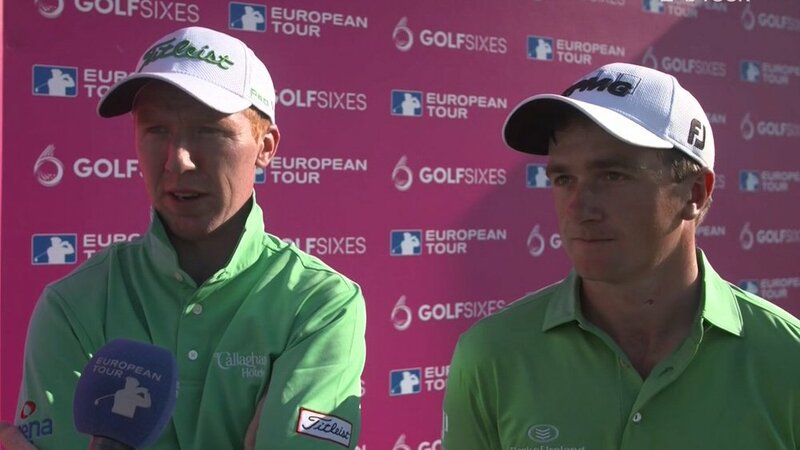 Walker Cup winners in 2015, Moynihan and Dunne beat Scotland's Richie Ramsay and Scott Jamieson 3-0 and followed a 2-1 defeat to France's Mike Lorenzo-Vera and Romain Wattel with a crucial 2-0 win over Italy's Edoardo Molinari and Renato Paratore to top Group C from the French. They now face England Women, who drew 1-1 with the England Men side of Eddie Pepperell and Matt Wallace, then beat South Africa's George Coetzee and Haydn Porteous 4-1 before losing 2-1 to Sweden's Alexander Björk and Joakim Lagergren. However, the England Women advanced at the expense of the Swedes on the holes won rule (6-5) and now face the Irish who keen to go all the way. "Well, every team are good players here and over six holes, anybody can beat anybody, really," Dunne said. "But like I said, when you represent Ireland, if you're playing against an English team, it just adds that little bit to it, so we'll be fired up." If Ireland win they will play Thailand's Kiradech Aphibarnrat and Thongchai Jaidee or South Korea's Soomin Lee and Jeunghun Wang with Pepperell and Wallace facing French duo Wattel and Lorenzo Vera as Australia's Sam Brazel and Wade Ormsby take on the European Women's team of Carlota Ciganda and Mel Reid in the other quarter-final. There is a lot at stake, especially for Q-School graduate Moynihan, who has not made a cut since he won his card last November. "Yeah, we're both very happy," the Donabate man said after their win over Italy. "We're both playing well in practice, so we expected to have a good go at it. It was nice to especially pull off that win as we played so well. We're both very happy with how today went." Dunne added: "Yeah, it's been great. I've been lucky. I have a lot of my family over. It's a short trip, and my brother lives here in London. Nice to have a lot of people around. "Felt like we had a good bit of support. Nice sunshine. We hit the ball lovely all day. "So, any time you represent Ireland, it's special. It's a fun week but also when you have the flag beside your name, it's really serious as well, so we're happy to get through." Asked about Irish fans whispering 'Miss it!!' during the match with France, Moynihan said: "Yeah, on the back of the fourth hole, Lorenzo-Vera was over a like a 4-footer and he heard it, I think there's a few Irish fans, but that's all part of it. The first tee, I couldn't believe it. You're very nervous over it to be honest. Most nervous I've been in a long time hitting a golf shot, but it was fun." The European Tour broke new ground in the innovative event with men's and women's teams taking part this year. A mixed pairing of Ryder Cup Captain Thomas Bjørn and his Solheim Cup counterpart Catriona Matthew were among the 16 pairs taking each other on in greensomes match play over six holes in a round robin, with the top two teams in each group advancing to Sunday's quarter-finals. The European Women team of Ciganda and Reid pulled off a memorable result, defeating defending champions Denmark in a play-off to finish second in Group A behind the Thai pairing of Kiradech Aphibarnrat and Thongchai Jaidee. Australia’s Brazel and Ormsby won Group B to set up a quarter final clash with the European Women, while Thailand face an all-Asia clash against runners-up Soomin Lee and Jeunghun Wang of South Korea. "It's been great fun," Hull said. "I just feel good vibes from this event. It's really good because you see so many children and women and everyone around and the weather is perfect. I think it's a really good event for golf." Her thoughts were echoed by Reid, who said: “It's huge for women's golf. I have absolute faith in our partnership and we would have been disappointed not to get through to Sunday. My sister would have killed me because she only just arrived. “A shame for Denmark to go out with a three-putt on the last but we're very, very happy. It's great for women's golf. I think this is a huge opportunity to showcase women's golf. "We don't get the coverage and we don't get as supported as I feel like we should. An event like this is huge for us. Hopefully, a few more people will want to take up the game of golf now because they see how passionate we are about it.